Part one of this 3-piece fashion equation begins with this emerald print dress. The cut is classic and the pockets add a little note of "this girl gets it". The straps are adjustable and the cotton is softer than you think. Can I get an amen? *One note before ordering this dress: it runs small. Not just a bit small, really really small. Please order up a good 2-3 sizes. (I bought an 8 and it's none too short). Don't get caught up in the sizing. You will look flawless in this outfit! The second piece of our ensemble will draw some envious eyes south of your ankles. Black shoes are not easy to find as some pairs end up looking clunky and harsh. Trust me, this pair will go with anything and everything in your wardrobe. (Think leggings, skirts, suits, etc.). Comparatively speaking, these shoes are honest-to-goodness comfy. Its true, comfort isn't the first quality I look for when interviewing a shoe for purchase--but this pair is soft and feels great all evening long. Order a pair here. 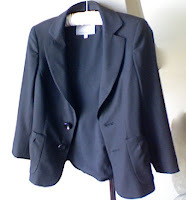 The third part of our fashion tri-fecta consists of a black fitted blazer. (We both know you own several of these). Scrunch the sleeves up a bit toward your elbows to make the outfit seem a bit more casual and easy. If you would like to use this outfit as a great excuse to snag a new blazer (and who wouldn't?) This one is marvelous. Easy as 1, 2, 3. I can't wait to hear where you went in this fantastic outfit!